Be sure to provide accurate measurements to ensure the Heat Savers you buy from us fit properly. Please measure ALL of your vents before asking for a quote. Send an email with your name, postal address, contact phone number and the details of your vents including the outside, inside and border/frame sizes and quantities of each different sized vent. Please include a photo of one of each style of vent if possible. Follow the steps below and enter all the information required into the form, this might NOT work with all email software. Please feel free to edit the email before sending. "Click" on the TEXT QUOTE link at the top of the page and copy and paste the details into a blank email then complete your details and send the email to us. Phone for a quote. Contact details at the top of this page. Please have all vent details ready when you call and please measure ALL vents separately..
We will email a quote to you from heatsaver@hotmail.com including shipping to your door. Be sure to provide accurate dimensions to ensure your that Heat Savers fit properly. Include a photo or photos of your vents where possible. Please measure ALL of your vents before asking for a quote. Don't assume they are all the same size. 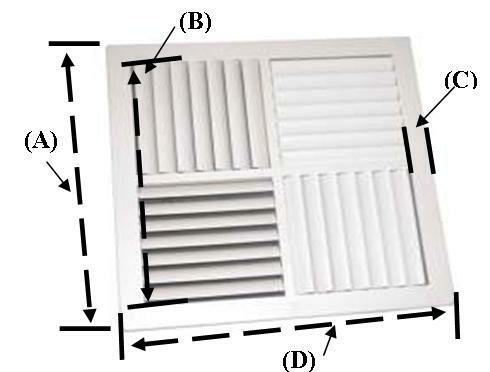 Vents in similar sized rooms can be different sizes. THEY MAY LOOK THE SAME BUT OFTEN THEY ARE NOT. We have a large number of different sized Heat Savers in stock to suit various sized vents. We suggest that you make a note of the details of your vents as a precaution in case your email doesn't reach us. In this case please send them in a blank email or phone or text us for your quote. Step 5 Look at the edge of the vent and note the shape of the border/frame profile. Flat with radius (rounded) corners. Flat with LARGE radius corners. 25mm Curved with 10mm inner frame. * We are unable to supply Heat Savers for "V" shape profile vents as there is no flat border for the collar to be attached to. Is vent metal or plastic? * We can't supply Heat Savers for "V" shape profile vents as there is no flat border for the collar. Is Vent plastic or metal? How did you hear about Heat Savers? e.g. Friend, Workmate, Home energy testing,Home Insulation expert, advertisement, Search Engine (Google Yahoo Ask or similar) If you used a search engine can you please tell us what word or phrase you searched for? Our fee free payment plan ---> Simply pay 5 OR 10 weekly payments. Your Heat Saver order will be sent when it has been paid in full. Please attach or text a photo of each different style vent you have if possible. After you have entered all details please click the "Submit" button below. This will open your email software, check the details and then click on send. If the email is blank please either grab a screen shot or contact us using any method listed below. NB: If you require more than three different size Heat Savers please submit a second request or edit the email before sending. Only click reset if you want ALL entries cleared! NOTE: If you selected option 1 and completed the form some email software may view this form as a security risk and will either warn you about this, send a blank email or simply do nothing.